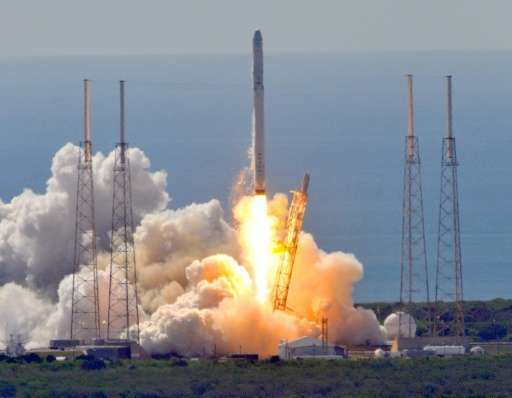 SpaceX on Monday blasted off a secretive US government satellite, known only as NROL-76, marking the first military launch for the California-based aerospace company headed by billionaire tycoon Elon Musk. "And we have touchdown," a SpaceX commentator said on a live webcast as cheers broke out at mission control. "The first stage has landed back at Landing Zone 1. Another good day for us at SpaceX. A beautiful sight to see." Live video of the launch showed the first and second stages of the rocket separating about two and a half minutes into the flight. The larger portion of the rocket, known as the first stage, made a gentle arc and powered its nitrogen thrusters to guide it back to Earth. After a fiery entry burn, the rocket set itself down steadily in the center of the 300-foot (91-meter) circular landing zone. Musk is leading an effort in the rocket industry to re-use costly parts rather than jettison them into the ocean after each launch. SpaceX has already made multiple successful landings—some on land and others on floating ocean platforms, known as drone ships. The sensor in question was replaced ahead of Monday's attempt. Little was known about the payload, which a SpaceX commentator described only as a "satellite," due to its classified nature. "As a matter of policy and because of classification, NRO does not provide information about our contracts," an NRO spokeswoman told AFP. SpaceX to was selected to launch NROL-76 "after a competition," said the NRO spokeswoman. She said she did not know when the contract was awarded. The contract was first announced last year. SpaceX also has a pair of launch contracts coming up for the Air Force to send GPS satellites into orbit.